Greetings Readers (and Beaders! ), thanks for stopping by for another blog from Eureka Crystal Beads. Today I have the pleasure of introducing you to the next jewelry artist we’re featuring for my monthly Artist Spotlight series! For the month of August we’re featuring Bead Artist Norma Jean Dell, who creates her sophisticated, yet playful, jewelry and tutorial patterns from her homebase in the Knoxville area of Tennessee. She features her patterns for sale in her Etsy shop: NJDesigns1. (Go take a peek!) Norma Jean was kind enough to give me a sneak peak and I can promise you that they are fantastically detailed and clear. Please read on to learn a bit more about this talented artist who we’re happy to feature and who we look forward to working with in the near future! Norma Jean states she loves “all beads!” but that she especially loves to design with all of the new shapes and styles of beads that are coming out. 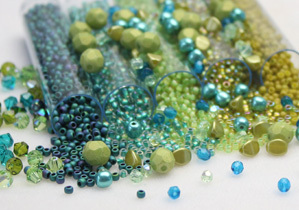 She sees them as a challenge to get them to all work together in a design alongside the tiny seed beads she utilizes. After a time, the local bead shop in Tennessee where her passion was first born encouraged her to teach her designs there. That’s when she began to create her own tutorials and received positive feedback from her students who felt that her instructions were easy to understand and follow. When it comes to her Etsy shop to sell those patterns, Norma Jean credits her husband, who was so proud of her, as being her biggest influence to sell her patterns and introduce her designs “to the rest of the world!” She also states that she has been influenced and inspired by many of the “master beadweavers” but takes specific note of Sabine Libbert, whose style, use of color, and positive attitude she admires so much. Please go take a peek over at Norma Jean’s etsy shop to see all of the beautiful tutorials she has to offer! We look forward to working with her more in the future. And as always, please visit the Eureka Crystal Beads website for any of your jewelry and beading needs! Previous Post Casual Fun: Flat Peyote with Toho Aiko beads!